Glasses: Ace & Tate. Lips: Trish McEvoy. Necklace: Laura Lee jewellery. Long necklace: Missoma. 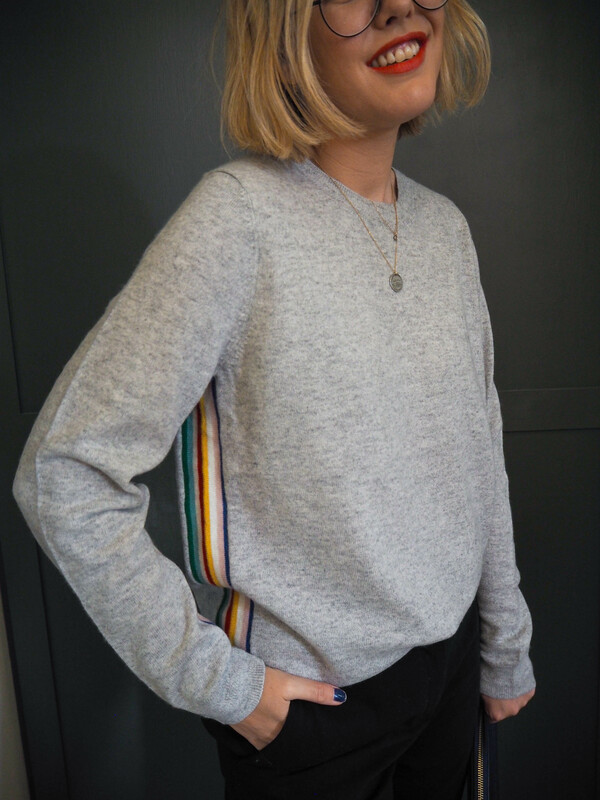 Cashmere jumper: £119.95, Gap. Trousers: £79, Cos. This has been one of the most requested posts recently, so thought I’d better get it in before Christmas wish list time. But first, I need a bit of a disclaimer. This is not a post about the cheapest cashmere on the block. 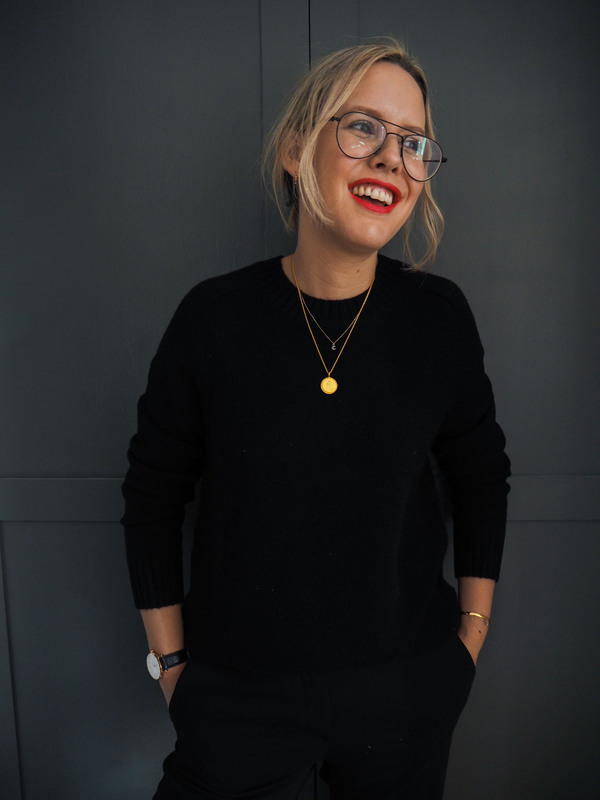 It’s all High Street and “affordable” cashmere (I put that in loose quotation marks) but it’s also my edit, as a Fashion Editor who has worked on magazines and seen and touched A LOT of jumpers over the years. It’s what I believe to be the best quality and value for money, as opposed to the cheapest. These are also the styles I would wear, so mainly crew-necks with a polo neck thrown in as opposed to v-necks and I’ve worn them all with the same trousers so you can see the different styles. 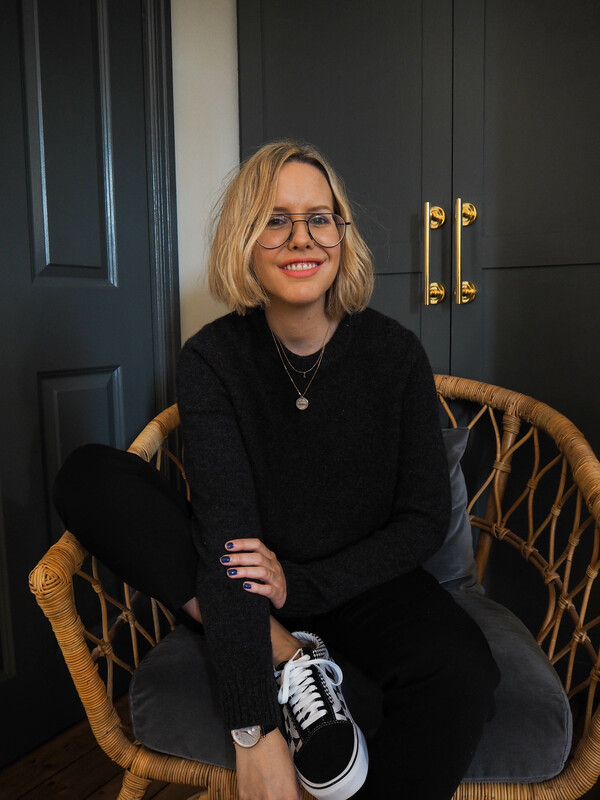 There is also the ethical issue of cashmere, so I am also discussing brands whom I believe to be the most sustainable – but please do your own research if this doesn’t appear to be the case for you. Lastly, I called in all this product to shoot, and have returned it to the relevant PRs. This is a research piece, using personal anecdotes. I don’t own all of these jumpers! But I worked really hard to find jumpers that are all available now for once, as I had such a stock issue the last time I did this round-up so hopefully it is more user-friendly this time! I always get told that the best High Street cashmere is Uniqlo or M&S, however, I firmly believe it’s Gap. 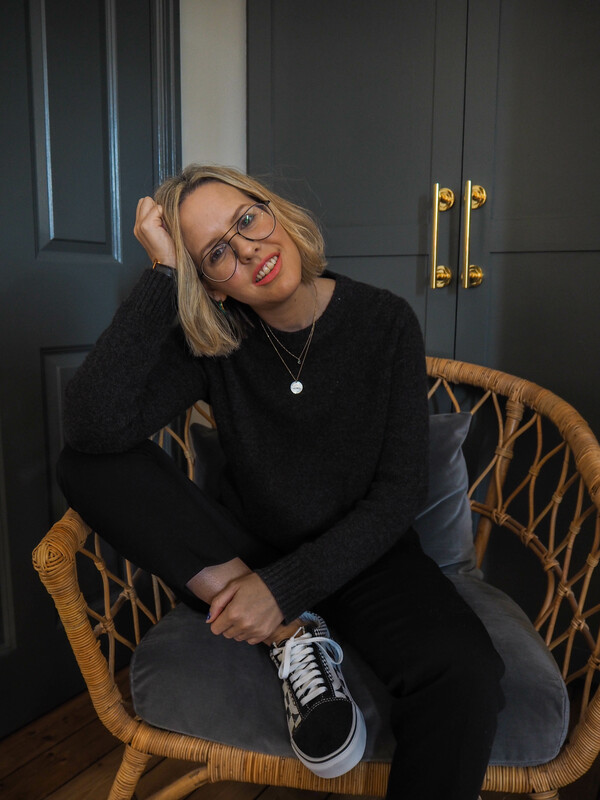 I have a charcoal grey jumper from about 4 years ago that is my absolute favourite, it has NEVER bobbled and when I pack away all my cashmere in the summer, this is the one I allow myself to keep out, in case of a chill. This season, they have a chunky poloneck too, but for me, the crew-neck in black would be the perfect investment. Sadly, cashmere is always excluded from those 40% off discounts….except apparently for this Black Friday – the discount is being honoured! I am wearing size Medium, which is perfect to me. Jumper: £75, Marks & Spencer. Necklace: Laura Lee jewellery. Trousers: £79, Cos. Lips: Laura Mercier. The classic, ultimate, comes in 17 colours cashmere (the pillarbox red would be very useful, too) and it is machine washable at 40 degrees (but 30 would be kinder to the environment, don’t you think?). Marks & Spencer are also pretty good for other forms of cashmere too – their tracksuit bottoms are what lounging on the sofa dreams are made of. I’m wearing a size 10 which is a good fit, but could easily wear a size 12 for a more relaxed look. Jumper: £130, Boden. Trousers: £79, Cos. Lips: Trish McEvoy. Necklaces: Laura Lee jewellery. I’m going to say it: I wasn’t sure Boden were capable of doing a ‘subtle’ print but they’ve hit it spot on, here. I’ve always avoided too much print from Boden in the past, opting for the plainer pieces but this jumper is just pure joy. It’s machine washable but it is quite snug fit, I’m wearing a size Large. ALSO TRY: Wyse London and Jumper1234. Charcoal jumper: £125, Cos. Trousers: £79, Cos. Lips: Smashbox ‘Paris Pink’. Necklaces: Laura Lee jewellery. Vans: Second Store. After wearing this, it might just overtake Gap for best cashmere, it’s so soft and the grey is that perfect charcoal with just the right amount of cosiness and specks. I’m wearing a size Small, and it’s nice and oversized. The downside? Like most things in Cos: it’s dry-clean only. Jumper: £145, Common Thread.Trousers: £79, Cos. Lips: Buxom in ‘Extreme Heat’. Watch: Larsson & Jennings. Made with 100% Grade A cashmere and using a Hong Kong factory, creating jobs for out of work artisans, this is a brand with a difference. And there’s free UK shipping. 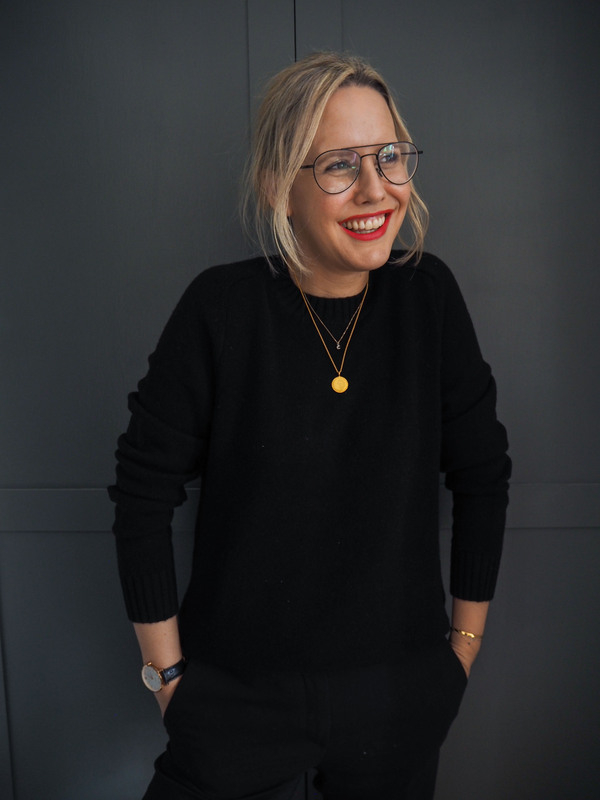 This has a natural, oversized fit and is cropped so is, in fact, the perfect jumper for achieving that ‘J Crew tuck’: I am wearing size S/M. So that’s my really edited edit, but these are the ones I truly believe will stand the test of time and will stay in your drawers for years to come (just be careful of those moths!). If they do bobble, use a cashmere comb (ooh – what a lovely gift that would make – or am I just getting old?!). And it doesn’t have to be a jumper – I have tracksuit bottoms (M&S), a beanie hat (And Other Stories) and have been known to buy Chris a cashmere scarf in the past (in Liverpool FC colours, of course!). Hope you found that helpful and ENJOY the warmth! This is excellent intel, thank you! Hi Alex, I recently bought the Boden striped jumper in your feature and sadly it is not £98. but is in fact £130. But can confirm it is fab. Will change now – oops! I love a cashmere sweater. I may be slightly addicted! Mine are all “affordable”. I remeber buying the first from Cos, in Paris about ten years ago – grey, long length, thumb holes in the sleeves and still goin strong with minimal bobbling. Most of the rest is from Boden, and gets worn all the time in the winter (none of it bought for full price!). I dont have a gap near by, but I’ll certainly keep my eye open. 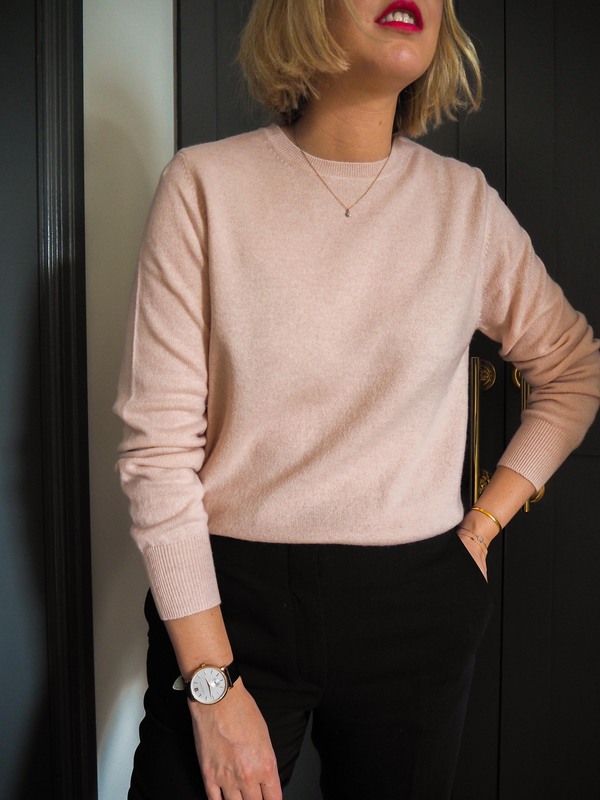 Hello – I have the cos knit and can vouch for their cashmere, it lasts really well. Their cashmere scarves and hats are fab too. I also really rate the quality of Jigsaw cashmere. 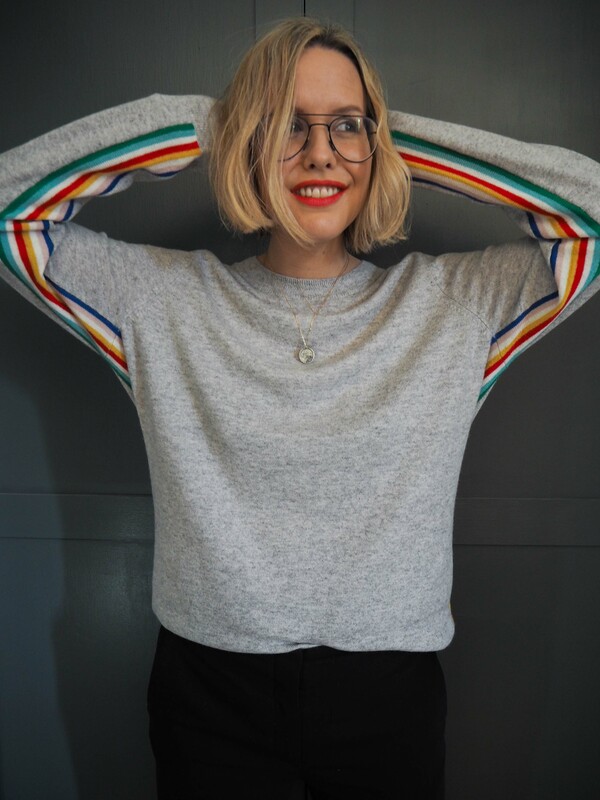 I had a quick look at the Boden jumper and it’s actually £130 (the plain ones are £98), although there’s always a discount code to be had for Boden! I love your cashmere edits! Inspired to try Gap and pair with Vans and a red lip, thank-you for such practical advice with beautiful pieces. Please do more high street edits of seasonal basics? Thank you Alex great post! I don’t own any cashmere but changing my mind. Next time I should buy one cashmere instead of four other lesser quality sweaters. Can’t wait!